This Saturday, I participated in PTI’s online stamping event, Stamp-a-Faire. First up is Ribbon Techniques Challenge aka Knots Badge. I used the tutorial for ruffled ribbon behind a die cut. I backed it with another die cut and added a brad through the back into it. To use the bookmark, you slip the page between the die cut and the bookmark base. That’s why I used a brad, for strength and as a substitute instead adhesive which might stick to the pages. As much as I created this in a hurry as I knew my SAF time was limited as I had a graduation party to go to, I am pretty happy with this one! I love your bookmark! 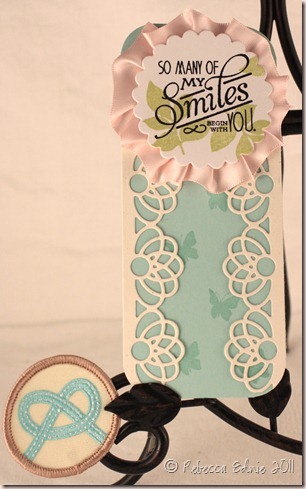 Great use of the ribbon and I like how you used the borders too!